A private weather agency forecast says India will experience normal monsoon this year raising hopes of a better harvest after the first back-to-back shortfall in rainfall in three decades. Showers during the four-month rainy season starting June will likely be normal as the El Nino effect will neutralize by the middle of the year. The news is significant as India’s economy remains vulnerable to droughts and fluctuations in rainfall. 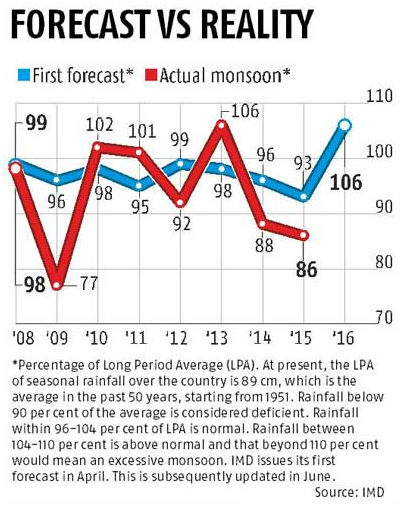 As per the data from the Indian Meteorological Department, rainfall was 14% below a five-decade average in 2015, preceded by a 12% shortfall in 2014. 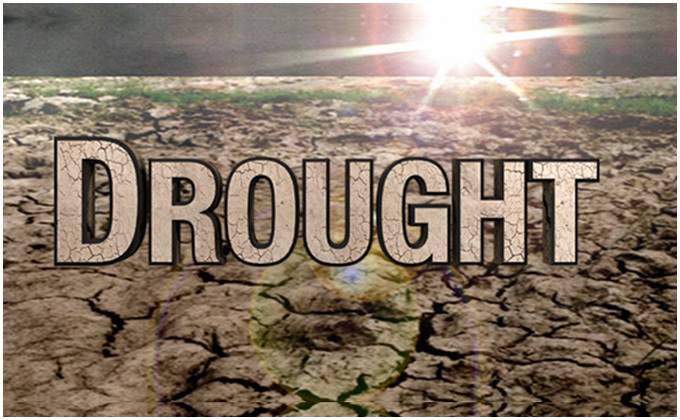 The two consecutive years of drought situation parched vast tracts of farm land, hurting rice, corn, sugar cane, and oilseed crops. This year the Modi government is counting on a normal monsoon to sustain economic growth and keep food inflation under control. The monsoon accounts for about 80% of India’s irrigation needs, affecting both summer and winter sowing. Normally sowing begins in June. The seasonal rain waters more than half of the farmland in addition to raising water table levels everywhere.Normal rainfall is usually synonymous with a better harvest, which, in turn, improves demand for two-wheelers, motor cycles, and tractors. On the contrary, a drought can simultaneously lower GDP growth, raises inflation, and add to fiscal pressures, more so in India’s case as structurally our economy remains imbalanced. About half of India’s 1.3 billion population remains employed in the agriculture sector, which accounts for roughly 18% of the country’s 2 trillion dollar GDP. Not surprisingly, the uncertainty surrounding monsoon rainfall and the potential impact of a deficient rain on agricultural production constrains RBI’s monetary policymaking. In fact, the RBI’s latest decision to keep rate cut to just 25bps has been reportedly shaped by the extent to which this year’s monsoon will support or damage growth and inflation. India’s vulnerability to drought heightens monetary policy challenges. In economic terms, sluggish growth in an economy is attributed to lower inflation outlook prompting central banks to infuse monetary policy stimulus to propel consumer spending. In India’s case, however, a bad harvest produces a double whammy effect – both weakening growth as well as pushing food prices northwards – which complicates the matter for RBI. Liquidity in this case could backfire as more money would chase fewer food products. A liberal monetary policy to revive weak growth would exacerbate inflationary tendencies. On the other hand, a tight policy to rein in inflation could slow down the growth. The RBI cannot take that chance when the economic recovery remains fragile. India’s higher vulnerability to patterns of rainfall than many other similar placed economies basically stems from systemic factors. For starters, a weak rural infrastructure enhances the impact of volatile rainfall on agricultural output. As the sector employs a majority of India’s population, the impact of lower output on rural incomes adversely impacts GDP growth. In addition, a lack of efficient food distribution system heightens the inflationary impact of lower agricultural output on the cost of food. Moreover, as the average income levels remain on the lower side, food inflation further hurts rural and urban household purchasing power as a large portion of Indian household spending goes in buying food negatively impacting overall consumption cycle in the economy. And on top of everything, food inflation forces the government’s food subsidy bill thereby raising associated fiscal risks. Despite suboptimal monsoon and the systemic challenges, if food inflation remained under control last year it was because of lower oil prices, which also helped Indian policymakers to tame overall inflation. The luxury may not remain available to India in the medium term, especially with fast rising population putting additional pressure on food demand. Unless the government addresses these structural and supply related challenges, food inflation will remain a major constraint on the economy. India needs to strengthen its food supply and distribution to counter fluctuations in rainfall in the medium term along with improving irrigation facilities in the country. It is in this context, the Modi government needs to fast forward retail sector reforms, particularly in multi-brand retail. The entry of large retail chains will bring best global practices in supply-chain distribution and warehousing, which will help many of the systemic challenges discussed above. In addition, the government needs to review and expedite its ambitious river-liking project, which again will boost domestic commerce and irrigation facilities in the country.